Member of the Agavaceae (agave) family. Related species include Century plant, tuberose, yucca, dracaena. Leaves 1-3 feet long and 4-6 inches wide. Plant is a tender evergreen shrub or tree. Hold at 50-60F, with high humidity. From the Greek “kordyle” (a club) referring to the large, fleshy roots of some species. 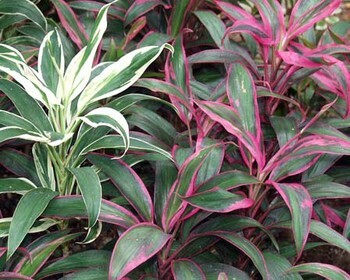 Emerald green form and darker green form with pink margins available. Leaves can be cut or stapled into various forms. Leaves often shipped with wet cotton wrapped on ends.